Ant Attwood supported my latest mashup Sunny Lax vs. Adiva feat. Vicky Fee – How Does It Misgrey (Martin Müller Mashup) in his radioshow Amplitude Radio 025! Happy New Year! I hope you all had a good start into 2010 and that you’re ready for a new episode of Tic Tac Trance. 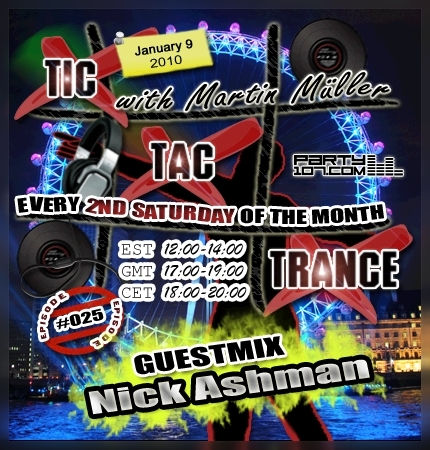 Episode #025 will be broadcasted on January 9 on Party107 and will feature a guestmix by Nick Ashman. Nick will open this episode of my radioshow with a progressive mixture of his favorite tunes. My job for the second hour will be to continue the flow of the set with some bangin’ uplifters and great peaktime trancers. I’ll also unveil a new mashup I did exclusively for this show.